Guarantee: 6 month warranty on any manufacturers defects. This is a great bed!! It is more like a cave for Cats!! It is soft, warm and cozy everything a cat loves. There is a removable cushion inside that makes it easy to clean. Just pull out the cushion clean off the fur and then put it back! Ta Da!! It is soft velvet with a waterproof and skid-free base and is completely machine washable. This is so cute and looks fabulous it your home!! It has a removable cushion for easy cleaning which is machine washable. It is a few Inches up off the floor which is great for keeping your pets out of the draft. Its warn cozy and comfy and holds up to 110 lbs. I love this little bed it’s very CHIC for the spoiled little Kitty!! FYI the color is actually a darker brown than the picture not as two-toned. This bed is great for being off the ground but easy to get into. 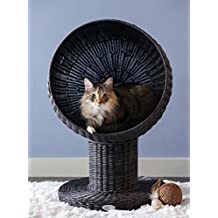 Its made of non toxic poly rattan and is very durable even to your kitty’s clawing paws! The cushion inside is very soft and machine washable. 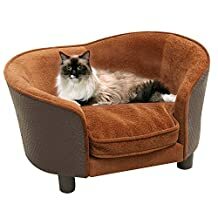 The 17 inch dome gives your cat plenty of room to cuddle up and enjoy their cat naps. I LOST MY CAT – WHAT TO DO IF YOUR INDOOR CAT GETS OUT!! CATS AND ESSENTIAL OILS – SAFE OR NOT?